Make payroll easy. Displays recipient name and address through envelope window. Overall Size: 9 3/16" x 13", Check Size: 3 1/8" x 7", Stub Size: 3 1/8" x 6"
For quantities over 2400, please contact customer service. Make life at work a little easier with manual business checks that are ready to go in the mail. 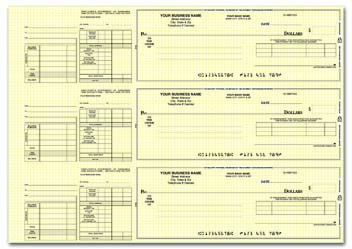 These special payroll checks are designed to work with our Manual Envelopes and Pre-Printed Envelopes. 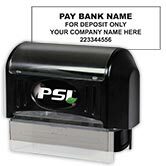 Your company's address and your employee's name and address will show through the double-window envelope. Just stick the check inside and send it on its way. 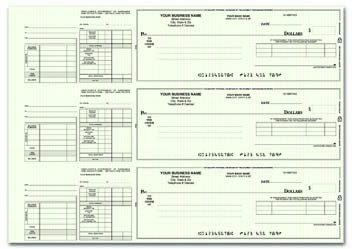 These convenient checks can work as both payroll and general disbursement checks. There is a detachable stub for your staff detailing hours worked and deductions. Order Payroll Self-Mailer Checks now and make the task of distributing payroll at your small business go by a little quicker! 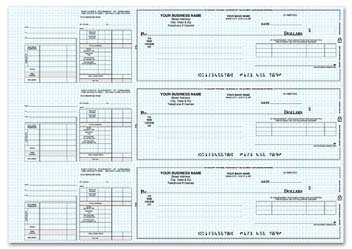 You can also order a seven-ring binder or comb binder to help keep your new checks organized.